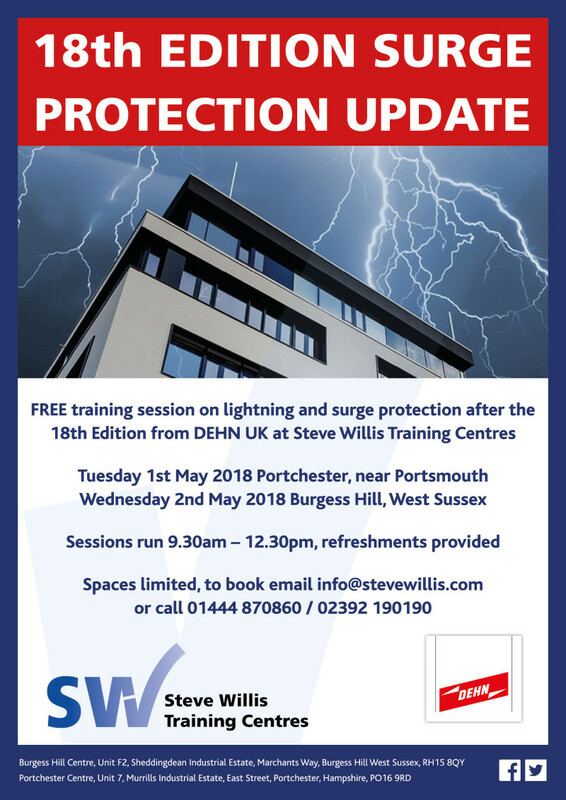 The 18th Edition is bringing changes to surge protection requirements, so we've invited surge protection specialists DEHN to run a FREE update course at Steve Willis Training Centres in May. The course will cover the tightened regulations and increased mandatory demands included in the 2 SPD sections of the regulations – 443 and 534 (SPDs) and 444 regarding earthing. Course leader Robin Earl really is the expert, as he contributed to this part of the 18th Edition as a member of JPEL64 sub-committee D.
Spaces are limited, so email info@stevewillis.com or call 01444 870860 / 02392 190190 to book your place.